What a custom quote for garage equipment but don’t want to get into a lengthy sales conversation? Here at Straightset, we understand that you want to be able to get access to accurate costs for new or replacement garage equipment, at a time that suits you, without having to ring sales people and get stuck into a long sales conversation. That’s why our website has the functionality to be able add products into a virtual ‘quote’ to get a bespoke quotation direct to your inbox. Allowing you the complete flexibility to access the information you need any time day or night, on any device from mobile phones, to desktops and tablets. The Straightset website showcases an exhaustive range of garage equipment, categorised by equipment type (vehicle lifts, mot equipment, tyre and wheel equipment, air compressors, lubrication services, workshop furniture, exhaust extraction, air conditioning, garage tools, workshop accessories). Also by manufacturer (e.g. Nussbaum, Slift, Werther, JAB Becker, Shure, Beissbarth, HPC, HPA-Faip, Nederman, Alentec Orion, Majorlift, Pitlift, Bahco) As well as by price and a full range of important features, to help you narrow down the right equipment for your needs. 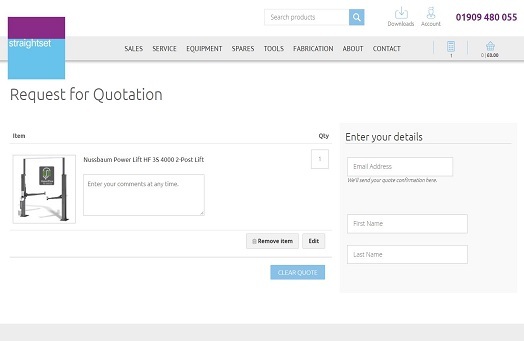 Once you have found the equipment you are interested in, you can update the quantity you need and click on the button to ‘add to quote’. This takes you to a simple form where you have the ability to add comments to enable us to get the most accurate quotation for your needs. By providing information about what you need, enables us to provide alternatives, accessories that may suit your requirements better. We only ask for your address so that we can arcuately quote you on delivery and installation costs – if required. Your data is only used to correspond with regards to your quotation and we do not pass you’re your information to any third parties. Your email address is used to send your quotation directly to you. Once you submit your quotation online, you’ll get an instant email with your quotation reference, so you know we have received your quote. We aim to respond to quotations within the next working day, depending upon the complexities of your requirements. These quotations are built by our knowledgeable sales teams, with years of experience in garage equipment. Your quotation will be sent to your email address, with additional information that may help you make the right choice. You can accept the order directly through the email or contact your dedicated contact to discuss the quote in more detail, all the information is clearly explained in the email. So, why not ‘add to quote’ today and see for your self how easy it is to use.